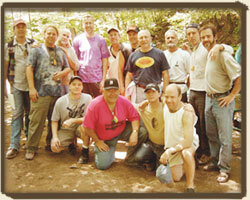 Natural Passages is a one year male initiation program. It is a program that enables the core integrity of the man to surface. It is designed to awaken, develop, and nurture the essence and fullness of being a man in today’s world. Our focus is developmental. We seek to invoke the unfoldment of mature masculine energies. Our goal is specific. We seek to assist each man to find his place in the world. Our hope is honorable. We seek to fill the void of mature men that can stay within the center of whom they are regardless of circumstances. Our dream is selfish. In helping you to find your place in the world, we envision your helping others to do the same. Therein, we can build community and make a difference in the world. Learning how to share the deeper parts of ourselves with other men without shame or guilt. Learning how to clarify and state our wantsand needs as men. Opening to the possibilities of life versus miming the social and familial roles and rules assigned to us as male children, adolescents or adults.